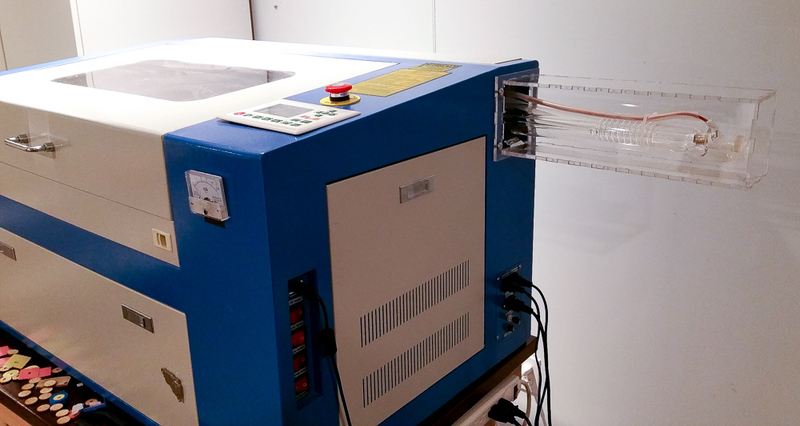 It’s been almost a month since i upgraded my SH-G350 laser cutter to 60Watts of cutting power. Here’s at last a comprehensive How To guide for all you DIYers out there. 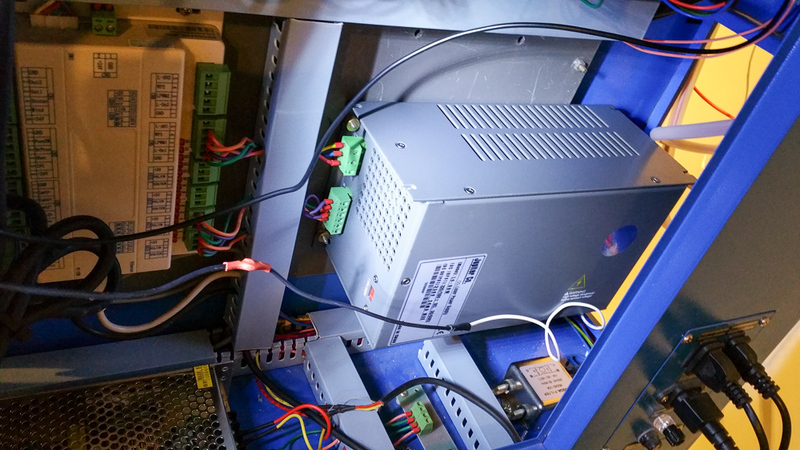 Upgrading this laser cutter has been a pretty big project for me, it probably took me few months to plan and execute this, mostly because of uncharted territory. 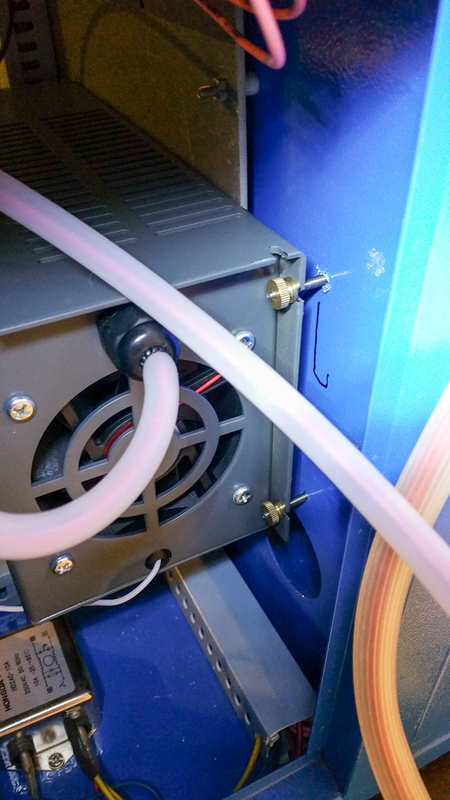 I got some help from great guys at Laser Cutter group on Facebook, especially Jeff Body who already did this upgrade and provided me with plans for CO2 tube extension enclosure. Anyway let’s begin. Scissors, screwdrivers, Allen keys, pliers, respirator, safety glasses, etc. you might sustain by following this guide. 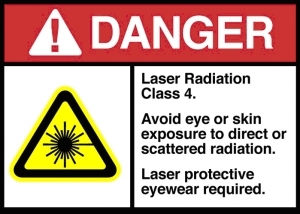 always wear adequate eye protection. so please proceed at your own risk! 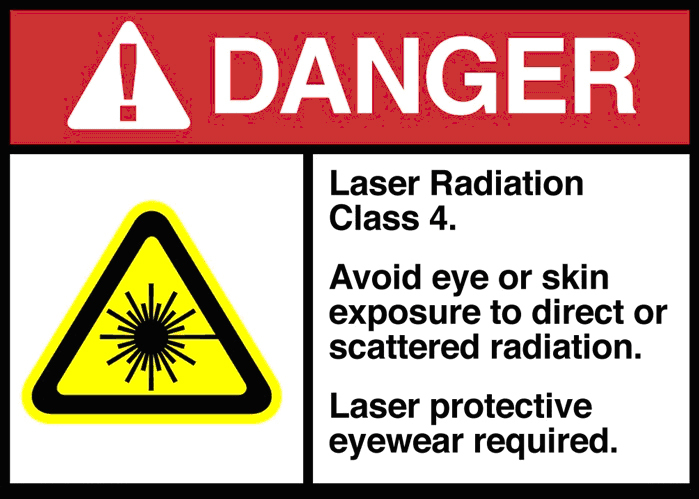 To show you that I really mean it, here are some bright warning labels. First cut 24 x 24 acrylic sheet into more manageable pieces with table or other saw. SH-G350 has maximum work area of 500 x 300 mm, so cut your sheet accordingly. You will need two pieces. Cut out your parts using these design files. Original design by Jeff Body. Once again, please be very careful. 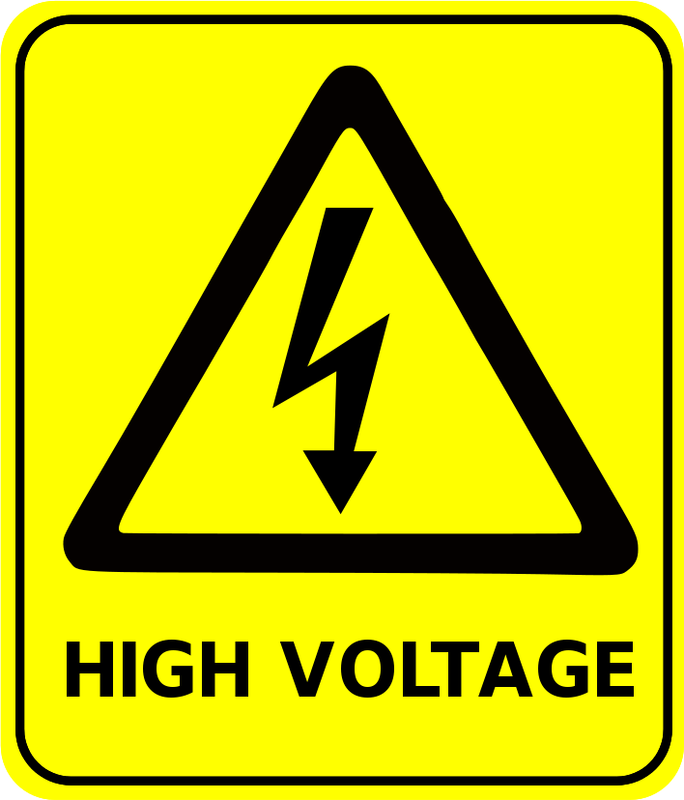 High voltage remains in power supply even after it’s been unplugged for some time. Unplug and give it some time to dissipate (30 minutes to 1 hour). One advantage of doing PSU first, is that you can test it right away without removing of the old tube. Disconnect and remove old Power Supply. It should be attached with 4 screws onto board that holds all the electronics. I just cut negative (black) and positive (red) cables, so I can connect old tube to new PSU. 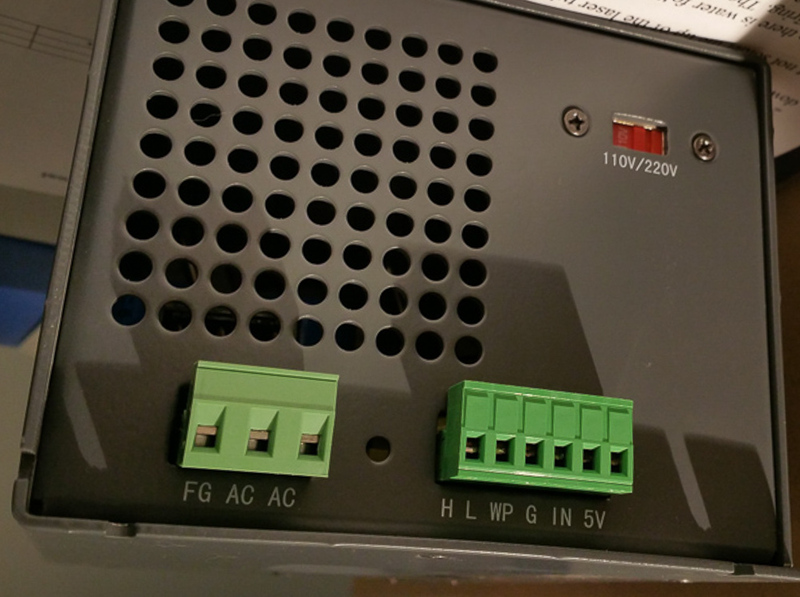 Other than connection to the laser tube, power supply has 2 green terminal blocks. One has 3 pins, other one 6. 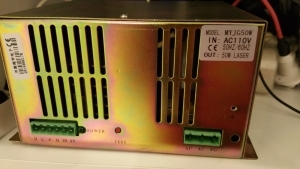 Compare how they labeled on old and new power supply. You’ll need to match them. 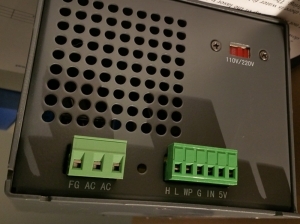 On new PSU 3-pin connector is reversed (FG-AC-AC instead of AC-AC-FG) compared to old. If yours is like that take small screwdriver and switch wires in terminal block. Make sure other block also match. Mine did. Now you’ll need to figure out how to mount it inside. New PSU is much larger that old one, so I mounted mine horizontally. I’ve placed mine where I though would be a good position, and marked mounting hole locations. You will need to drill holes all the way thru metal and grey mounting board. Because of tights space in electronics section, you’ll have to drill from inside of the laser cutter (under z-bed) so guessing where wholes should be can get tricky. I measured where of of them should be and drilled it. Then put 4-40 screw thru the hole, and place PSU on top of it to make sure it fit where I wanted. Once you get one hole right, rest should be easy. Just measure distances between mounting holes on PSU or trace it on piece of paper, then using template drill accordingly form other side. Try each one, to make sure it’s in right place before drilling next. At this point if you want you can test this part of installation by connecting power supply to old CO2 tube. I tied negative cable to black cable coming from tube, and red cable to red. Each connection was secured with electric tape, and took especial care suspend positive (red) cable far from any metal surfaces. Then I powered up machine, and fired it at very low setting (10%). Since tube fired, I knew that PSU and connections were good. Disconnect power, wait for electricity to dissipate and disconnect tube from PSU. Original tube that came with the machine had very crappy mounts, almost impossible to adjust. It was basically thick pieces of rubber sandwiched between metal plates. A little more travel space in adjustment slots (needed for larger tube). Elongate one of the bottom mounting holes (as it didn’t fit on my machine). Inner support doesn’t have space for nuts, instead 10-24 machine screws are screwed directly in the plastic. I used low resolution (somewhere around 0.4mm layer height) and low fill density (around 30%). 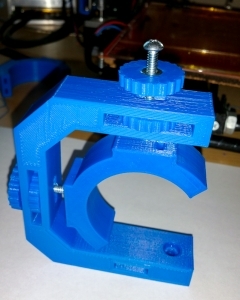 It takes around 3 hours to print, if you able to do it one go. One obvious issue for people without 3D printer is how to make these. Well many libraries provide access to 3D printer, there are many Maker Spaces, and some UPS stores can even print it for you. Alternatively there are different kinds of mounting brackets you can buy online, some are adjustable for different CO2 tube diameter. In Part 0, you cut parts for tube extension. Now you will put them together, which is super easy. It’s a good idea to add some ground plane to the extension. You can use piece of aluminum, with drilled hole at the end to which you attach wire. I had some aluminum sticky flue tape which I just glued on one side inside enclosure. Then I soldered a wire to large paper clip and attached clip to end of the aluminum tape. Once everything is assembled this wire will be connected to grounded chassis. First you’ll want to remove old CO2 tube. Remove top back cover (slide out right hinge on the spring and slide out whole cover). Disconnect and drain all cooling liquid from hoses and from the tube itself as much as possible. Take inner support bracket and carefully thread in 10-24 screws. When you feel it’s not going in any more, stop and mark this length. This way you’ll know how far they can go without breaking thru plastic and possibly damaging your CO2 tube. 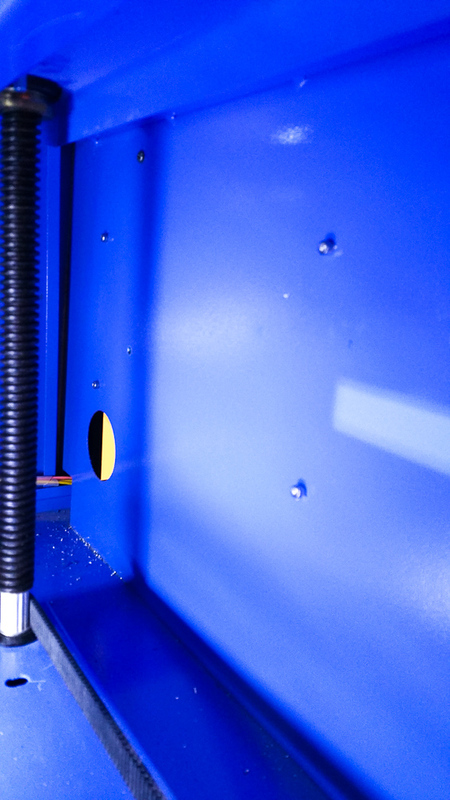 Attach Outer Support brackets to the machine, open end facing front of the cutter. Either use old screws or use 4 shorter 10-24 screws. Measure, cut and stick cork pieces to the inside of the inner brackets. Place inner brackets (one by one) around your new CO2 tube and fasten with long zip ties. Don’t over-tighten. You should still be able to slide brackets along your tube. Thread knob with attached nut onto each of the longer screws. Put remaining two knobs in the slots of the outer support bracket, and thread screws from previous step into them slightly. Slide in new CO2 tube thru side opening, position where you want it and slide Inner Support brackets until they inside outer support brackets. Rotate tube so water outlet is on top. This way air bubbles can escape easier. Carefully thread screws thru all knobs and into inner support bracket, making sure you don’t go too far past mark you made in step 1. That’s something I didn’t realize when I was doing upgrade. Because new tube is so much longer, you won’t be able to use existing water tubing. Instead I got very flexible silicone tubing from Amazon. They have very similar inner diameter to the original tubes (5/16″ vs 8mm ID of originals). 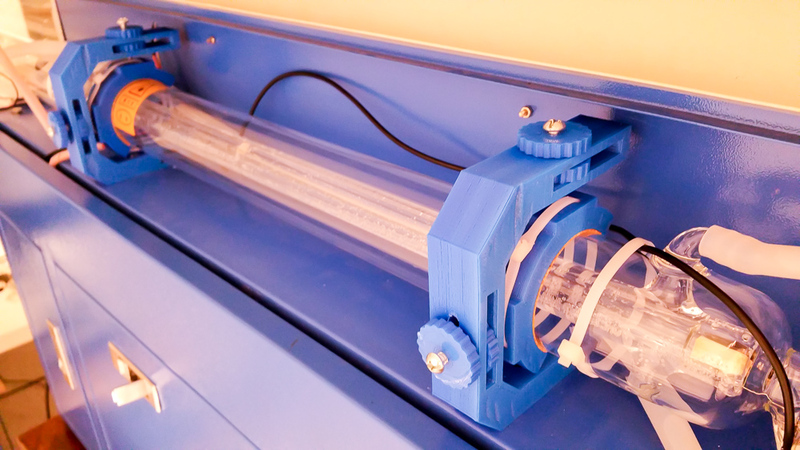 Measure how much of the water tube you need to reach from inlet on back of the machine to the far end of the laser tube and add some slack. Now cut at the mark with scissors or knife. Try to make cut as even as possible. You can replace the other (outgoing) water tube as well if you wish. I did. In fact I replace all original water tubes with new ones. Secure new water tubes with zip ties to the inlet/outlet and flow sensor. Thread longest water tube thru the hole, behind the tube and attach on the far end. You can use zip-ties there to secure it. That side is inlet. Now thread shorter tube thru second hole and attach to near end of the tube (outlet). Make sure this outlet is position on top of the tube, so air bubbles don’t get stuck. 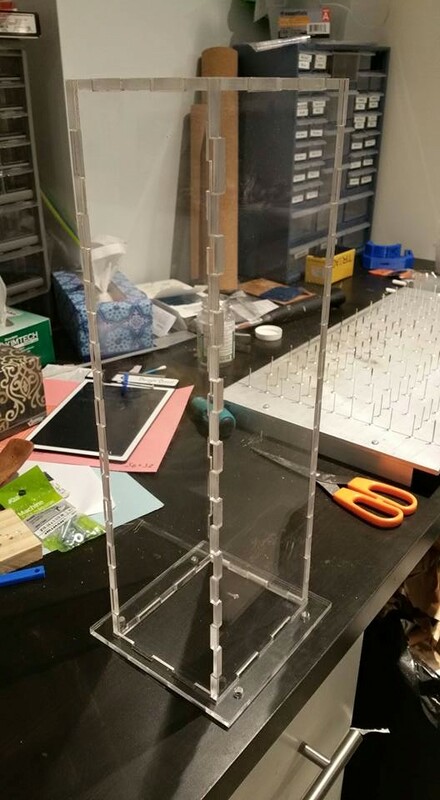 Zip tie water tubes, but not too hard so you don’t crack glass. Connect tubing to pump and fill it water. Check for leaks and kinks. Make sure all power cords are unplugged and there’s no residual charge left in power supply before starting this! NEVER SOLDER wires to CO2 tube terminals. They are made out of tungsten and solder will not stick to it, but more important you can crack tube’s glass and void warranty!!! Notice how original wires were connected. They were wrapped around terminals, the piece of tubing was placed on top and filled with thermal adhesive. I think that using PTFE tape before putting adhesive on is better idea, as it will hold better and leave terminals clear of sticky stuff. Solder long piece of black wire to PSU’s negative wire (or screw to Ammeter if you have one in the loop). Insulate connection with heat shrink tubing or electrical tape. Now thread this wire into the laser tube compartment. Strip about 0.5″ inch of insulation and twist bare wire around CO2 tube’s negative terminal (cathode). Please note there might be a thin wire already attached to it, and going into water tube. Leave it there as it provides ground to water tank. Now take piece of plumbers tape, tightly wrap and tie it around terminal. 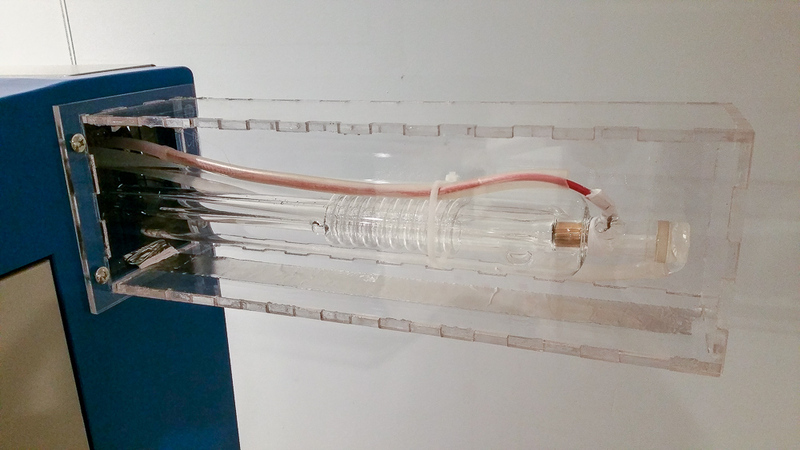 Put some thermal adhesive on top, or even cut small piece of tubing, fill with adhesive and slide on the terminal. Similarly attach positive (red) wire to tube’s Anode terminal. This wire should already be long enough to reach it without splicing. Red wire is enclosed in tubing for better insulation, but large piece at the end was still exposed. To be on the safe side I added piece of tubing on that section. Now is good time to test if tube will fire. Pulse at very low power setting. I discovered that my new tube won’t fire until I set power to minimum 13%. Old one would fire at 10%. Also remember that your tube is probably not aligned towards 1st mirror at this point, so you could be firing outside of your machine! This is probably easiest part. 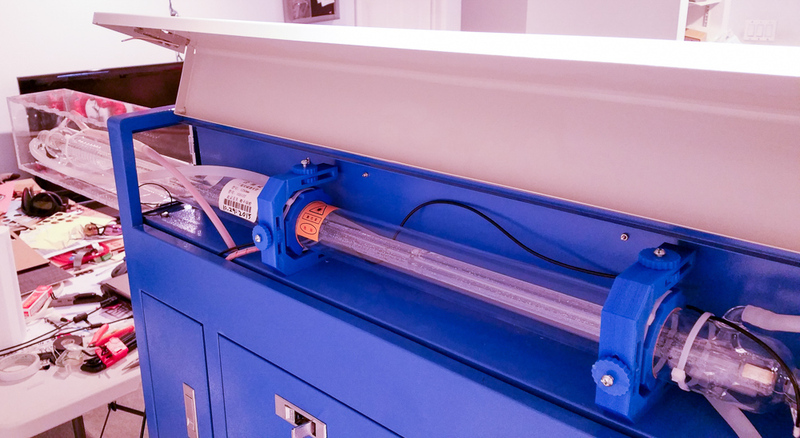 Carefully slide enclosure over end of CO2 tube and attach it to chassis with four 1/4″ screws and nuts. It’s best if you have second person to help you hold it while you messing with screws. Attach wire connected to ground strip inside enclosure to one of the mounting screws. Check with multimeter if you have connection from strip to the ground. Get rid of all bubbles in the tube if possible or you risk damaging it. Large ones at the ends can be moved by physically lifting each end of the machine. I had to lift mine pretty high! I still can’t get rid of smaller bubbles in the water tho, so if you have a suggestion let me know. And please NEVER use antifreeze in water. Mine was actually creating arks inside tube and dropping power. I had this issue for long time with my old tube, and only realized that antifreeze was culprit after I installed new tube and started to have same issues after adding antifreeze… Once I replaced it with regular distilled water problem was gone! Laser Engraving and Cutting Facebook group – for tons of knowledge and assistance. I have the same machine and used your tube mount design, thanks! The only way you could tell our machines apart now is that I bought a sheet metal extension from Automation Technologies instead of making it out of acrylic. Hello. What is thé cutting speed différence between old tube and new 60w one…?